About Superior Car Parts, Inc.
Superior Car Parts, Inc. was formed by designer and developer Ron Grace and several Midwestern car guys when Girtz Industries recently spun off its car parts division, Antique Car Parts by Girtz. For more than four decades, the small Indiana manufacturer had built Top Irons that were used by most of the American hot rod body manufacturers, restoration shops, and the biggest-name hot rod builders. Trained by original owner Elmer Girtz, Grace has been hand-making beautiful polished stainless Top Irons for more than 20 years. Grace and his new team acquired the machinery and original patterns from Girtz, including patterns for all open-body styles of early Fords from 1928-39. Grace has engineered two-inch chop versions for each top as well. Superior Car Parts also builds duplicates of original fender braces for early model Fords. All products are American-made. Ron Grace heads the design and development department at Superior Car Parts. A mechanic since 17, Grace brings 21 years of handcrafting antique car parts to Superior. "The best thing about my job is taking a piece of raw steel and turning it into a beautiful Top Iron. I know it's going to go on someone's car, and it's going to look beautiful. That's what gets me going," Grace said recently. Grace uses the specific skills of an engineer, mechanic, machinist, welder, and quality control to handcraft beautiful car parts for open-body styles of early Fords from 1928-39. He has engineered two-inch chop versions for each top as well. Superior Car Parts also builds duplicates of original fender braces for early model Fords. Grace enjoys the challenges that go with constructing a Top Iron and designing a new top for a customer. "I like to try new ideas, making sure they will work." Grace says he's very open-minded to a customer's wishes. All car parts handcrafted at Superior are made specifically for each customer. And if there is a design flaw, he wants to know about it-he likes to make it right. "I'm dependable for our customers. I want them to feel they can call me if they have a question, and I will help them to the best of my ability," Grace said. 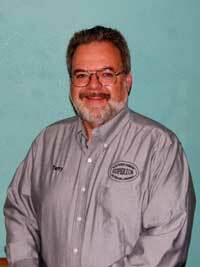 Superior Car Parts welcomed production head Tim McGinnis in 2008. McGinnis, a Chicago native, has been fabricating sheet metal body parts since 1982 when he moved to North Carolina to construct cars for NASCAR racing legend Bobby Allison. The first car he built for Allison won the 1982 Daytona 500. McGinnis continued to build cars for Allison for five more years, including the 1983 Winston Cup winner as well. McGinnis has been in the automotive industry his whole life. He became interested in early Ford models as a boy since his dad owned a 1931 gun-metal blue Model A. Attending the Indy 500 race and museum when he was young, he caught the racing bug at 15, running on dirt tracks 100 mph at the Santa Fe, IL, raceway. A photo of Henry Ford hangs in McGinnis's office at Superior Car Parts. Henry Ford motivates McGinnis, from building race cars or early model car parts to company vertical integration, bringing all production in house. "Henry Ford was the best at vertical integration." At Superior Car parts, McGinnis produced the first vertically-integrated car part made-a lower stanchion post. "It's an honor to build these parts for people, and since the parts are stainless steel, they will last for generations. Grandchildren will be able to enjoy this stuff," he said recently. Terry McGinnis, Director of Sales, joins his brother Tim McGinnis and Ron Grace at Superior Car Parts, providing quality hot rod and restoration parts. Terry’s love affair with the automobile started at a very young age. By age 17, he owned and operated his own service station in Downers Grove, IL, soon adding another full-service gas station. During his 22 years in the service station business, he wore many hats: ASE certified mechanic, general manager, handy man, tow truck driver, service writer, and teacher. As the industry began to change, Terry moved forward as the Manager of Sales and Marketing for a starter and alternator company. He continued as a teacher, technical seminar instructor, and successful salesman. So successful, in fact, he was recruited by a trucking broker company to expand its existing customer base. He added more than 100 new customers, and annual sales totals of more than a million dollars. Because of his combination of business and technical background, he was offered the opportunity to assist in the start-up of a new hot rod business. Ten years later he is still involved in building show-winning cars. Terry is involved in every process of the “ground-up” build from metal fabrication and electrical wiring, to the final delivery of the car. An exciting new chapter in his career, Terry is combining his technical and sales experience again at Superior Car Parts.